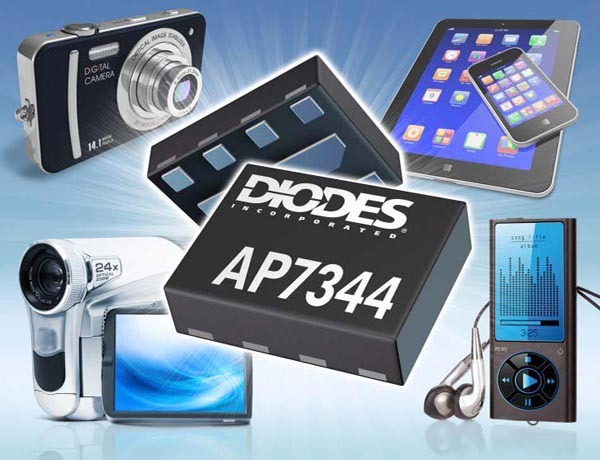 Diodes Incorporated introduced the AP7344. This dual 300 mA low-dropout (LDO) regulator offers high 1% output accuracy and a low quiescent current of 50 μA. The AP7344 features a small package to suit battery-powered consumer products such as cameras, smart phones and tablets. The AP7344 supports input voltages from 1.7 V to 5.25 V enabling it to cover the full range of Li+ batteries typically found in portable electronics systems. It provides a regulated output voltage, VOUT, that can be fixed between 1.2 V and 3.6 V, with an accuracy of 1% at +25 °C, and is capable of driving 300 mA loads. Other key performance features of this regulator include: low RDSON, a high PSRR of 75 dB at 1 kHz, low output noise of 60 μVrms, and a low 50 μA quiescent current that contributes to power savings, which lengthens battery life. The AP7344 comes in a small footprint X2-DFN1612-8 package, making it well-suited for the dense PCB layouts typical in portable electronics systems. It offers a competitive alternative to similar industry-standard LDOs with comparable performance but at a lower cost and with the added benefit of higher efficiency under light load operating conditions.